Tours scheduled in May, June, and September. Tours scheduled in July and August. Each of our tours will have a maximum of 8 guests. We promise personal attention and an opportunity to experience France as a local might. It would be impossible to do this with a larger group. 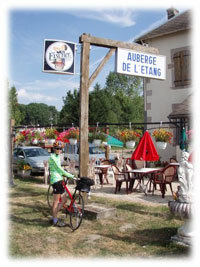 You are not looking for french bicycle tours : Wouldn't you rather be on the beach? You can also check on budget last minute holiday deals with www.onthebeach.co.uk. Lunch for each guest for six days. Four days we will provide a picnic lunch supplied by the hotel. On two days we will dine at an auberge along our route. Dinner for each guest for six nights. We have a number of guides available all summer long. Your primary guide is a bilingual native of Autun, a school teacher in the winter; he has a background in archaeology. He knows this region intimately and is looking forward to sharing it with you. He will be assisted by a second guide, and on occasion, a third will also assist. 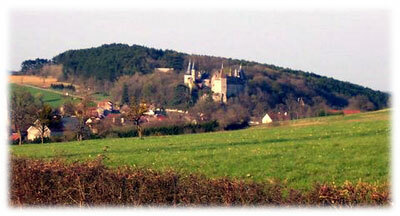 While in Autun, you will be staying each night at my favorite hotel in Autun. Your hosts have much experience providing for cyclists, so much so that French Tour de France teams have stayed at the hotel. Last year they also hosted the Italian triathlon team. Most meals are provided. Breakfasts will be at the hotel. 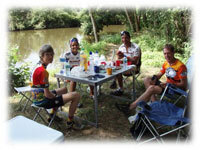 Lunches will range from picnics by rivers and lakes, to typical French lunches in out of the way village restaurants. We will visit a number of different restaurants for dinner so as to give you the broadest experience. On a few nights you will be free to explore on your own. For those bringing your own tandems or solo bicycles, we encourage you to bring your own tools for assembly. Rest assured however that the local bike shop will be available to assist throughout the week. In case of mishap, we will have spare tandem specific parts available, such as wheels, cables, and timing chains. If you are bringing your own bike and have an unusual set-up, or obscure parts, please make sure you carry your own repair kit. You will have a choice of renting one of our Co-Motion tandems. At the moment, solo bikes are not yet available for rent. Bike shoes with recessed cleats. We will be getting off the bike often to visit sites and it will be more convenient for you to have mountain-bike style cycling shoes. Another option (not recommended for riding comfort) is to pack a pair of walking shoes. 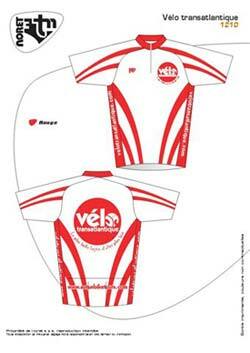 A small pack or jersey with adequate pockets, in which to carry a small amount of additional gear as you are accustomed to. Your own medicine for allergies such as bee stings if necessary. Lunch will be provided, however if you require more frequent energy intake, feel free to bring your favorite energy bars, or supplements. Although we will be traveling well maintained rural roads with very little traffic, we always recommend glasses to protect your eyes from road grit. These are not the leg breaking slopes of the Alps, but this is a region of rolling hills with some very long climbs. Ask our previous guests and they will tell you, an above average level of fitness is necessary. We ask that you honestly assess your fitness levels as even with the very modest daily distances we have planned, you will get a workout. 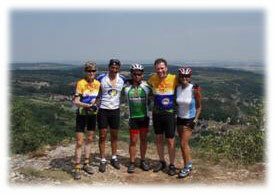 You will enjoy this tour much more if you are in moderately good condition, and have practiced your climbing. As climbing usually requires descending shortly after, solid downhill experience is recommended as well. I’d like to again emphasize that while this is not a “performance tour”, I have to admit that your tour guides do like to play on their bikes, and will periodically challenge each other to a short sprint. These are as fun to watch as they are to participate in. Participation is not required. Lastly we ask that you bring a great attitude. As with most things in life, a great attitude will be rewarded with a great experience!